Hello everyone! I’m Joba Manaois. I am from Midsayap, Cotabato, Philippines. I am currently a Full Time Trade Marketing Manager and Part Time Traveler. This blog was actually intended for my everyday endeavors – how do I get to live my life, how do I live by my principles and how do I enjoy every blessing that God has given me. I love to travel anywhere. I want to eat a lot. I am always up game for adventures. I write poems and songs. I wanted my blog to contain stories and pieces wherein I can share to people how I am so enjoyed in these little things of life. Me as a Coffee Dreamer. I started to love coffee when I find out that need to have one to survive my school requirements. Way back in High School, coffee was already my study buddy. But basically, coffee was just a hand reach in our house and coffee shops have not started to uproot in our town. My Coffee Story starts when I study in Davao City. My first year in the big City is a thrift year for a “probinsyana” girl like me. I always thought of coffee shops as expensive destinations that I will not spend my money for it. Drinking coffee? Why spend for more than P50.00 if 3-n-1 at P5 is available in the market? Coffee shops are boring… There’s no fun in there. Alright! These things have been subjects for fun arguments that I always get into with my friends when I invite them to go to coffee shops. But my “Marketing skills” are what I always put in my pocket when I am into these situations. Aside from the coffee that you buy, you also pay for the ambiance, the experience, the free amenities, the coziness and the feeling of home. Coffee is just a fraction of the whole experience in a coffee shop. For an ambivert person like me, coffee shop has been my second home that I can run to. 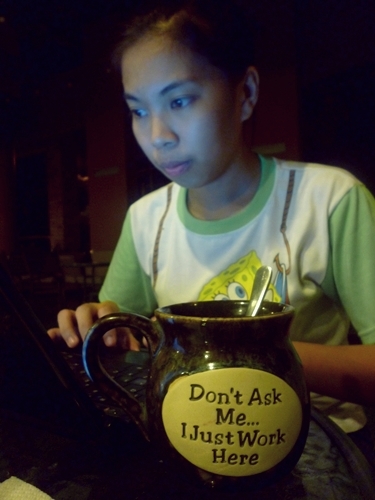 I have been to almost 3/4 of the total number of coffee shops here in Davao but I miss to write my experience down. Sooooooo, I come to reinvent my personal blog with a touch of being a coffee shopper blog. My intent is to somehow revisit all the coffee shops and start to share to you my experiences for your guidance also to your own experiences.